Cooling power on the go is what this neat little gadget does best. 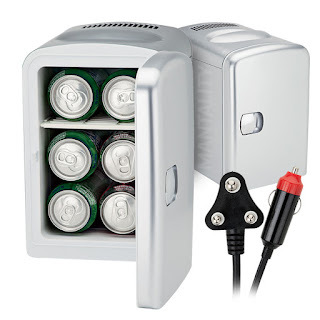 With enough space for a 6 pack, it'll cool your beers or soft drinks down to about 18*c in approx 30-40 mins. It's removable shelf means you can store anything that'll fit into it. It's the clever way to keep your cans cool on a trip or anywhere you have a 12v socket or a mains plug handy. What's also nifty is that if you need to keep things warm, like in the winter months, it has a settings for this too - and will warm to about 65*c in a similar timeframe. Useful for car trips, picnics, on the boat, or at the office. Dimensions (height x width): approx 30cm X 21cm.